Hey there Summer shred heads! Join us to celebrate Spring, Summer, Shred & Chill’s first ever Summer Surf Program. If you don’t know about the Chill Foundation, this is a perfect opportunity to check out what this youth empowerment organization is all about! 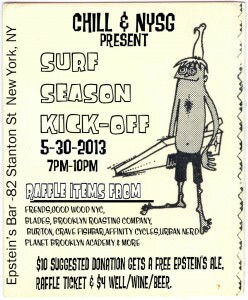 $10 suggested donation gets a free Epstein’s Ale, raffle ticket & $4 well/wine/beer. Shred flicks playing all night long. Enter the raffle to win prizes from Affinity Cycles, Blades, Brooklyn Roasting Co., Burton, Chill, Crave Fishbar, Frends, Good Wood NYC, Planet Brooklyn,Urban Nerd & more. youth to build self-esteem and life skills through board sports. This entry was posted in Lara's Blog and tagged Chill, Chill Foundation, Chill.org, Epstein's Bar, Fundraiser, Happy Hour, Summer, Surf. Bookmark the permalink.